French born singer/songwriter Cedric Gauthier realized his love of music at an early age and began to develop his musical talent through guitar and song. Early in his career he moved to the Caribbean island of St Martin and formed his first band with English singer/songwriter Jon Rolls. The band can be heard on local radio stations (Island 92) and could be heard in local clubs and bars (Sunset beach bar, Rancho, la Bodeguita del Medio...). 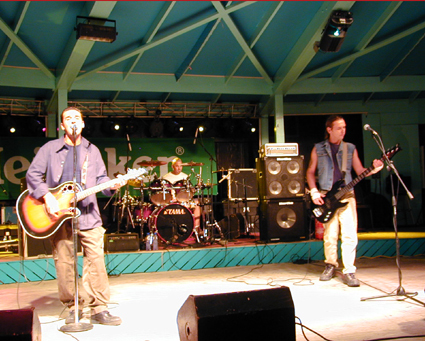 The band had showcased their two albums "Feel" and "Strawberries" (which was released in january 2005) as well as covered major influences including U2, REM, Bob Dylan, Crowded House and the Rolling Stones in over 100 shows a year. Starting january 2006 Cedric played a 192 shows run on the French Riviera, Italy and Switzerland, then returned to Chicago in april of 2007 to record a New Album with Chicago Blues Musicians. The New Album "I Wanna Tell You Something" was made available November 15th 2007, after about 50 shows in the South of France from june 14th to november 1st 2007. Yet another series of Shows started in Nice, France February 3rd 2008 and went on until Spring. Cedric released a Music Video for the song "I Wanna Tell You Something" in february 2009, 2 new singles were also released in october 2009: "Away With You" and "Eternity". A raison de 150 concerts par ans, Cedric se lance dans l'écriture de morceaux et sort 2 Albums avec 420. Sa passion pour la culture américaine le mènera vers Chicago, ou il passera tous ses étés pendant 8 ans, et assistera a de nombreux concerts, se produisant également avec des groupes de Blues dans divers clubs de la ville. En 2006, de retour en Europe, il lance une carrière solo qui l'amène a jouer presque 200 concerts en 14 mois, sur la cote d'azur, l'Italie et la Suisse avant de repartir a Chicago au Printemps 2007 pour enregistrer un nouvel Album: "I Wanna Tell You Something" avec des musiciens américains. En 2008, toujours en tournée dans le sud de le France il rencontre a Nice, Julien Loeffler, jeune réalisateur ambitieux qui lui propose une collaboration qui donne naissance a une chanson "Eternity" (sortie en 2009) mais surtout 2 video clips pour les 2 premiers titres de son Album "I Wanna Tell You Something" et "I Wanna Be Colin Farrell". Le premier est un projet d'étude pour Julien, réalisé en une journée et avec peu de moyens en février 2009 a Cannes. Le deuxième demandera 3 mois de préparation, une équipe de 15 personnes et une semaine de tournage aux studios de la Victorine a Nice, a Cannes et dans l'arrière pays Grassois au début de l'été 2010. Cedric Gauthier has released 2 albums, "Feel" in 2002, "Strawberries" in 2005 with his former 420/FourTwenty bandmates Jon, Dany and Daniel back in Saint Martin, FWI, and on november 14th 2007 Cedric released "I Wanna Tell You Something" recorded with Chicago Musicians from the Blues scene bass player Joewaun Scott, guitarist Rob Blaine and drummer James Knowles. ...after a 192 shows run in France, Italy and Switzerland that started january 9th 2006 and ended march 30th 2007 (see Articles section for dates), and 2 months in the studio in Chicago to record a New Album, concerts started again from june 14th 2007 at O'Sullivan's, Mandelieu to november 1st 2007 and the New Album "I Wanna Tell You Something" was released on November 14th 2007 !